Friday lunch usually means lunch with the colleagues. Yep, we take advantage of the longer lunch hour, and leave the Muslim men behind at the mosque! Hehe. 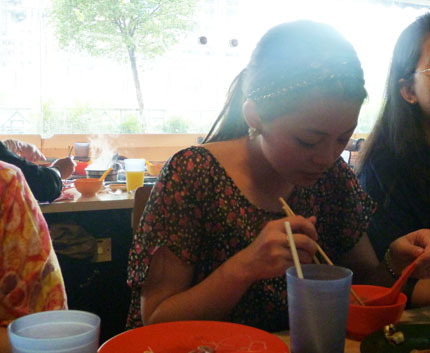 We had Seoul Garden today! 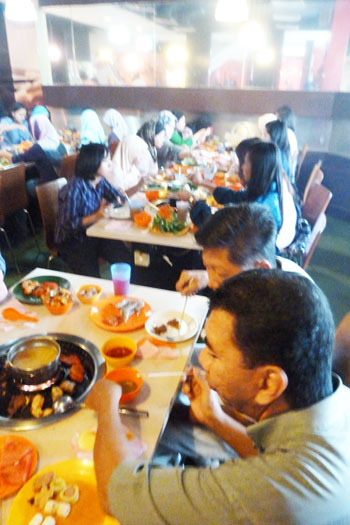 I’ve blogged about Seoul Garden before, but I just love the reasonably priced buffet concept. The food is yummy, but I wouldn’t go for the beef choices anymore because they’re not very tender. The fish is yummy though!! They marinate all their meat very well, super tasty! This is a scary picture, isn’t it? Hehe. Let’s all thank God we have facial features. But when I saw this picture, I was amazed by the mess we made on the table!! Thank God most of us don’t give two rats about table manners when it comes to cheap buffets. I would NOT bring my dad to this scene. He’s quite particular about eating etiquette in public, got to use the right plate, the right fork etc (although you should see him eating jagung at home….). I was trying to be all graceful, but man….buffet…. And plus, it was sooo hot and stuffy in there because of the steamboat and BBQ, so it was hard to stay well-mannered in there. Hehe. See?! Some of us couldn’t handle the heat in there. Don’t hog one dish and create a traffic jam behind you. Be quick! Don’t pile on your plate with a Mountain Everest of food. Eat what you can only (unless you can finish the mountain. In that case, God bless you..). It’s better to get up several times for more servings than to carry four plates of food on you. Do not touch the food with your hands and taste them at the buffet spread. They give you plates and tables for a reason. The bad part about Seoul Garden is when you leave the restaurant. My gosh, you will REEK of smoke and charcoal and yummy scent of BBQ all rolled into one. You’ll make anyone hungry drool coming near you. I still smell of Seoul Garden after so many hours. Need to shower and wash my hair now! I kinda miss your post about your opah la Vivy. How is she doing lately? PD, one table manner you forgot to mention. i hated it when people smell on their food. i mean like they sniff sniff and sniff to make sure if it’s good. and when it smells good, they sniff once more. or they just sniff sniff sniff sniff sniff on the menus and then they decided which food they ‘ll take it with them. Never tried Seoul Garden, but am tempted to after reading this post! Yeah i love that green top.but sold out.vivy u like the new headband? I still prefer the old range.